The Beagle (also known as an “English Beagle”) has been a popular rabbit-hunting English dog since the 1300’s (similar breeds may have existed as far back as 500 BC!). 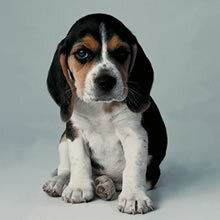 ‘Beagle’ derives either from the Gaelic ‘beag’, for ‘small’, or the French ‘begueule’, for ‘open throat’ (referring to the breed’s musical bark). Tiny versions of the Beagle, about nine inches tall, were bred to be carried around in the hunters’ pocket, or to be followed about on the hunt by children or the elderly. Beagles have been around in America since early colonization, and have grown to become one of the most popular American pets. Today, they are used for pack hunting a variety of game, such as Wild Boar, Coyote, Red Deer, and foxes. Their strong sense of smell and excellent temper make them popular drug sniffing dogs. Famous Beagles include Snoopy, Disney’s Beagle Boys, and President Lyndon Johnson’s Beagles. A national ruckus occurred when President Johnson picked up one of his Beagles by the ears on the White House lawn. This is a definite no-no! The Beagle has a shoulder height of 33 - 41 cm (13 - 16.25 inches) and weighs 9-11 kg (20-25 lbs). Beagles have a square muzzle, round ears, slightly curved, cheerful tails, and round feet. They have the appearance of a small Foxhound. The Beagle has a short, hard, sleek, weather-proof coat which may be any hound color. Tricolor (white, black and brown) is common, or a combination of white and yellow, orange, or red. Liver-colored Beagles are not acceptable. The Beagle is sociable, cheerful and independent. Beagles are very active and seem to be always ready for a walk or game. Beagles are attentive but never belligerent. They have a distinct bark when on the trail. Beagles are just plain cute! The Beagle is sociable, cheerful and independent. Beagles are very active and seem to be always ready for a walk or game. Beagles are attentive but never belligerent. They have a distinct bark when on the trail. Beagles are just plain cute! The Beagle should undergo early socialization with other household pets, especially cats or other small non-canine pets they are intended to live with. Beagles are friendly to dogs and children as well as strangers. Bred as a pack dog, the Beagle thrives on companionship with humans and other pets, especially other Beagles. They have a generally happy, lively demeanor and their tails are usually wagging. You can find Pocket Beagle puppies priced from $150 USD to $2300 USD with one of our credible breeders. Browse through our breeder's listings and find your perfect puppy at the perfect price. The Beagle should undergo early socialization with other household pets, especially cats or other small non-canine pets they are intended to live with. Beagles are friendly to dogs and children as well as strangers. Bred as a pack dog, the Beagle thrives on companionship with humans and other pets, especially other Beagles. They have a generally happy, lively demeanor and their tails are usually wagging. The Beagle should have its coat brushed daily and ears cleaned regularly. It should be bathed with a damp cloth occasionally. Beagles are generally very healthy, but susceptible to vertebral problems and hip dysplasia. Beagles live 12-15 years and have litters of 3-14. They can live outdoors in warm environments, as long as sufficient shelter and companionship is provided. Though at heart they are independent hunting dogs, Beagles are very suitable pets for the home. They are stubborn by nature and learn best from obedience classes. Beagles are eager to please and behave well once trained, aside from the occasional mischief. The Beagle needs lots of exercise and loves to go for a spirited walk. It has a high prey instinct, and should always be kept on a leash or in an enclosed area. The Beagle’s love of the great outdoors makes apartment life difficult, but manageable. Pocket Beagle Puppies for Sale - Shipped Worldwide! Finding the right Pocket Beagle puppy can be dog gone hard work. PuppyFind® provides a convenient and efficient means of selecting and purchasing the perfect Pocket Beagle puppy (or Pocket Beagle puppies) from the comfort of your home, 24 hours a day, 7 days a week. Take advantage of our PuppySearch or leisurely browse our directory of hundreds of dog breeds, Pocket Beagle dog breeders, Pocket Beagle dogs for adoption, and Pocket Beagle puppy for sale listings with photos and detailed descriptions. Some Pocket Beagle puppies for sale may be shipped Worldwide and include crate and veterinarian checkup. Many Pocket Beagle dog breeders with puppies for sale also offer a health guarantee. With thousands of Pocket Beagle puppies for sale and hundreds of Pocket Beagle dog breeders, you're sure to find the perfect Pocket Beagle puppy.